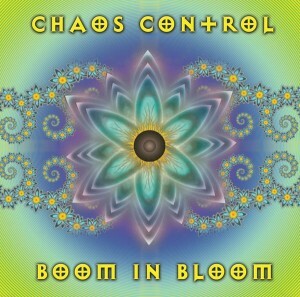 Boom In Bloom is Chaos Control‘s latest soulful blend of dubbed-out backbeats and chakra-shaking, wave-morphing bass topped with sweet, pristine classical orchestration and a subtle shake of squelchy synthesizer psychedelia. The release begins with the enchanting forest woodwinds of Cardioid Catalyst, which are joined by a seventy-piece string ensemble before being invaded by a punchy synthetic kick drum, syncopated hi-hats and snares, and an aggressive air-ripping bass infusion that blasts off into otherworldly glimmering synthesizer arpeggios. A decidedly daring and devilish demonstration of sound design, the next track Sentient Silicon betrays Planewalker‘s lascivious love affair with low frequencies and LFOs. At the half-way mark, the music takes a jazzy, mysterious turn into minor scales and moody melodies with Spring Saraband, whose electric pianos, viola ensemble and plucked cello get crunched to bits by a five-headed, ten-story-high bass-a-saurus that threatens to put psytrance on the decks! Fortunately, the monster falls dead before it can accomplish its goal, and the elves of the forest can be heard celebrating in relief as the credits roll with Boom In Bloom, the release’s cinematic namesake with Mister Chill’R’s signature reverb-laden piano lines. MP3 Download | FLAC Download | WAV Download · Download count: 5,573. Loving it. Beautiful oldschool-ish cover art, too! This is music that makes your mind travel to unknown places. Great vibrations! “Boom in bloom” . . sends a chill down my spine . .!! The font on the cover is from Diablo II ;) but you did some great tracks there.